"Among the conditions which make it possible for a (hu)man of exceptional ability to make a contribution of cultural change is the special composition of the cluster of individuals WITH whom (s)he interacts and THROUGH whom (s)he interacts also with others. The importance of the small group of identified individuals who surround the leader or innovator has not been so fully explored. 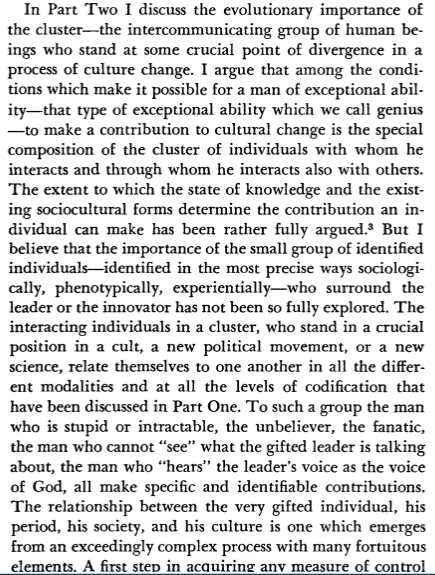 Glancing through Mead’s 1964 Continuities in Cultural Evolution, the primary theme is indeed the significance of the "small group" in the processes of cultural change. To get a sense of what the book is about, I’ll suggest a comparison. Think of it as a 60s version of Steven Johnson’s Where Good Ideas Come From. Like Johnson, Mead’s sensibility is evolutionary. She’s writing about how cultures evolve, not about how activists might intervene to "change the world." In a word — today’s omnipresent buzzword — both Mead and Johnson are in search of innovation. They wonder and examine what types of cultural contexts afford the rapid emergence of social innovations.